I FELT UNCERTAIN of what to expect as I walked slowly to the counseling center. A secretary directed me to a room at the end of the hall. When I entered I recognized most of the faces. The atmosphere was serious and somber. My first thought was to turn around and walk out, but I stayed, curious about the purpose of the meeting. I was a graduate student in the University of Maryland counseling program, so I knew about “interventions.” They were usually used to confront people with drug problems or those needing psychiatric help, to get them to agree to in-patient treatment. I had taken part in them a couple of times and felt sorry for the student who had to undergo the grueling mass attack. So when I suddenly found myself on the other side, the target of their intervention, I felt betrayed and devastated. Recently, for the first time in my life, I had been feeling some clarity and direction in my life. Yet here were my well-wishers, looking at me as if I were mentally incompetent. Clouds pushed through the gray sky. A small, thin girl stood on the sand, her face streaked with tears and her hair filled with sand and salt water. The beach stretched on for miles and miles without another soul in sight. Sand fleas hopped around noiselessly, kicking bits of sand up into the air. Now only a faint light was in sight. Small drops of rain hit her tiny face. She was lost. That small-faced girl lost on the beach was me. I remembered writing the paragraph when I was eleven. I was looking out my bedroom window in the early morning. The sun filled a deep blue sky, unusual for Washington State, yet I was filled with sadness, and tears welled up in my eyes. I felt so alone, as if I didn’t belong in this world. I wanted someone to help me through my despair. Years later in college, after numbing myself with drugs and ephemeral love affairs, I began to feel guided in my search for God. I went through the motions of life and ended up in graduate school. There I began to question the predictable course of my life: finish school, get a job, get married, buy a house, have kids, buy a bigger house, have grandchildren, grow old, get diseased, and die. I saw my parents and grandparents entrapped in this monotonous drama. For me it had little appeal. In fact, it all seemed downright pointless. I began to wonder if death somehow freed one from this tasteless pursuit and delivered a more meaningful and satisfying existence. I became intrigued by the notion, and by other questions of death. If death led to a better life, would suicide be a shortcut? How could I find out what happened after death and live my life accordingly? It was the summer of ’76, and many things began to shift in my life. I lost my attraction for nightclubs, parties, and concerts. I spent long hours alone, walking in the park and reading spiritual books. After realizing that meat was nothing but dead carcasses, I became a vegetarian. As the summer progressed I grew more reclusive and introverted. Life in graduate school loomed ominously before me, only days away. My college stipend required me to live in a dorm and oversee the resident undergraduates. A sick feeling settled in my stomach as I remembered some antics from students the previous year. Some had set a fire in the hallway. One had driven a car through the front door. Others had put the head of a dead bird on a fellow student’s doorknob. Contemplating a distracting term before me and my pressing questions about life, I decided to interview several people whom I felt had wisdom. They included a poetry teacher with deep insights into the futility of life, and a clinical psychologist I had worked with in a research project who had impressed me with his realism. I also decided to look up Neil and Elliot, two friends from undergraduate school. Neil, Elliot, and I would often eat lunch together and discuss metaphysical topics. Although I often didn’t understand their philosophical insights, I was attracted to their company. 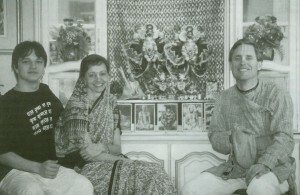 Then Neil and Elliot began to get involved with the Krishna devotees. While I had once seen these exotic-looking men with shaved heads and saffron robes chanting on campus, I knew nothing about their philosophy. With encouragement from Neil and Elliot, I bought a Bhagavad-gita As It Is and a set of chanting beads from them. They taught me how to use the beads to chant Hare Krishna, Hare Krishna, Krishna Krishna, Hare Hare/ Hare Rama, Hare Rama, Rama Rama, Hare Hare. But it all felt alien and foreign, so I put the beads in a drawer and the Bhagavad-gita in a closet. After that I lost touch with Neil and Elliot. I missed our philosophical luncheons and often wondered where they had gone. Now, two years later, I longed to discuss with them my thoughts of life and death, which grew more critical as the clock ticked and summer came to an end. Not knowing how to reach Neil and Elliot, I settled on visits to my poetry teacher and psychologist friend. The interviews with my mentors didn’t go well. My questions made them feel uncomfortable. I could sense they were worried about my state of mind. I tried to convince them I wasn’t suicidal in the classical sense but wanted to know their thoughts on death as a gateway into a more meaningful existence. Somehow, I wasn’t able to communicate my intent. Their feedback was more clinical than philosophical. I left each interview feeling disappointed and foolish. School resumed and I was forced to relinquish my solitude. I missed getting up at dawn and going to the park to read and write and pray. I missed having quiet and free time to myself. One day I was sitting in my room grieving over the loss of meaning in my life as it seemed to resume an automatic path. Could I change it? Was I the master of my destiny, or its servant? A knock at the door interrupted my thoughts. It was my friend Steve. He seemed concerned and asked me to attend a meeting the next morning at the counseling center, assuring me it was with people who cared and wanted to help me. I agreed to go. How could anyone help me when I wasn’t sure what I wanted? Actually I knew what I wanted; I just didn’t know how to get there. The day before, a professor had taken our class on a “guided visualization,” wherein we created our perfect life. I saw myself living in a spiritual community surrounded by beautiful trees in a natural environment. Everyone had the same purpose: to understand the true purpose of life and their eternal identity. I felt some hope from this exercise, as if some place like this actually existed. The next morning, at the counseling center, I encountered a grim-faced collection of my friends and teachers. My graduate-school advisor, a strong, masculine woman with a sardonic sense of humor, spoke first. In the past I had perspired in her presence and had tried to the say the right words to impress her. Recently, though, my desire to perform for some scraps of her attention had waned. I listened as she described the changes she had been observing in me over the past month. While I thought they were positive changes, she saw them quite differently. She voiced concern about my emotional distance and about how I appeared so quiet and sullen. She related how previously I had been outgoing and gregarious and so much more involved in graduate-school life. She then spoke of hearing I was having suicidal thoughts. At this point I realized the purpose of their meeting. Unless I could convince them I wasn’t suicidal I could end up committed to a psychiatric hospital. Although I felt quite intimidated, some strength came into my voice. I confidently spoke out that I was searching for meaning in my life. I was just looking for answers and was not suicidal. A psychologist I had seen but never spoken to seemed to sympathize with me as he recounted his own search, as a young man, into Buddhism and other Eastern philosophies. I felt some much-appreciated support from this thin, gray-haired man. Although I had no real connection with him as I did with others in the room, I was grateful he had come. My moment of solace abruptly ended when my advisor again spoke. I had been under a lot of stress and pressure, she said, and everyone felt a few days in the hospital would help me get back to my “old self” (the aimless, frustrated, unhappy self I now loathed). She concluded her appeal saying that they couldn’t force me to go but she hoped I would voluntarily agree. She offered to make all the arrangements. Her words pierced deep into the core of my heart. I felt betrayed by this room full of friends and teachers. Tears welled up in my eyes as I stared out the window. I felt a familiar sense of being out of place and all alone. I silently cried for someone to help me through my despair. I turned my gaze to my advisor. I stood up and left the room. Tears streamed down my checks. I pushed the metal bar to the heavy exterior doors. Sunshine flooded my eyes, momentarily blinding me. As my eyes adjusted to the brightness, they focused on two familiar faces standing directly in front of me. A surge of joy filled me. There stood Neil and Elliot heads shaved except for a tuft of hair at the crown. Clad in saffron robes, they seemed angels from heaven. Our meeting after two years at this exact moment convinced me that an omniscient being had orchestrated these events. I felt confident that my friends could give me the knowledge I had been desperately seeking. I wasn’t disappointed. To my amazement, Neil and Elliot answered each of my inquiries to my full satisfaction. Quoting from the Bhagavad-gita, Neil and Elliot explained that I am a spiritual being inside the body. The frustration I felt in material life was a sign that my spiritual life was awakening. My human body was a special gift to enable me to realize my true spiritual identity and revive my eternal love for my creator, my most dear friend. To annihilate the body untimely would hinder, not help, my spiritual journey. I continued to learn about the Gita from my friends in their spiritual community in Potomac, Maryland. Surrounded by trees and nature, I met a group of people living and working together to perfect their lives by loving God. It was just as I had seen in my vision only days before. I became convinced that a Krishna conscious life would bring me the meaning, purpose, and happiness I yearned for. Soon I withdrew from school and moved into the ashram, bringing a few possessions, including my chanting beads and Bhagavad-gita. Many people in my life, especially my family, viewed my decision as emotional and rash. Yet I knew clearly that all the events in my life had led me to this point. This was the culmination of my spiritual search. I felt bad that the people I loved were so disconcerted. My mother cried. My father yelled. My boyfriend told me it would have been easier for him had I committed suicide. Still, I was deeply convinced that this was what I needed to do. Despite this formidable opposition, I stuck with my decision and have never felt any regrets. Today, twenty-two years later, I’m married and have a son. I’ve completed graduate school and work as a psychotherapist counseling children and adolescents. My life now resembles the one I had envisioned and shunned in graduate school, but it is a very different experience. While I’m far from self-realized, just a little advancement in spiritual life has lifted me out of a suffocating trap of a meaningless existence. I begin my day with meditative spiritual practices, including chanting the Hare Krishna mantra on beads, reading from the Vedic scriptures, and worshiping the beautiful Deities in our home. These daily practices allow me to view things differently than I had previously done. Instead of just seeing the bodies of people I interact with, I now know there is a spirit soul inside each of those bodies along with the Lord Himself, who so kindly enters into the body of every living entity to guide our journey. While working with children in a therapeutic relationship, I pray to the Lord in their heart to assist them in healing from their traumas and help them on their spiritual path. I pray to the Lord in my heart to allow me to be His instrument so that His love and healing energy can work through me. When I’m in this consciousness, my work becomes an offering to Krishna and I detect His presence through my feelings of being energized, peaceful, and happy. And my home, rather than a shell filled with worldly ephemeral possessions, is replete with spiritual paraphernalia. Deities, pictures, books, tapes, and videos inspire our remembrance of the Lord. With one room dedicated to worship, we come together as a family to help one another make spiritual progress. Every day I thank Srila Prabhupada for translating Bhagavad-gita and coming to America to find a lost child.